International Maritime Organization (IMO) amendments that contain the international ship and port facility security code (ISPS Code) and U.S. Coast Guard NAVIG 10-02. In accordance with these new requirements and guidelines, attendees will learn to develop and modify a ship security plan, study potential weaknesses and apply correc- tive action to prevent an incursion. Attendees will also learn techniques for identifying and searching for dangerous objects and persons, as well as methods for conducting risk assessments based on type of ship, cargo, port-of-call and political variables. 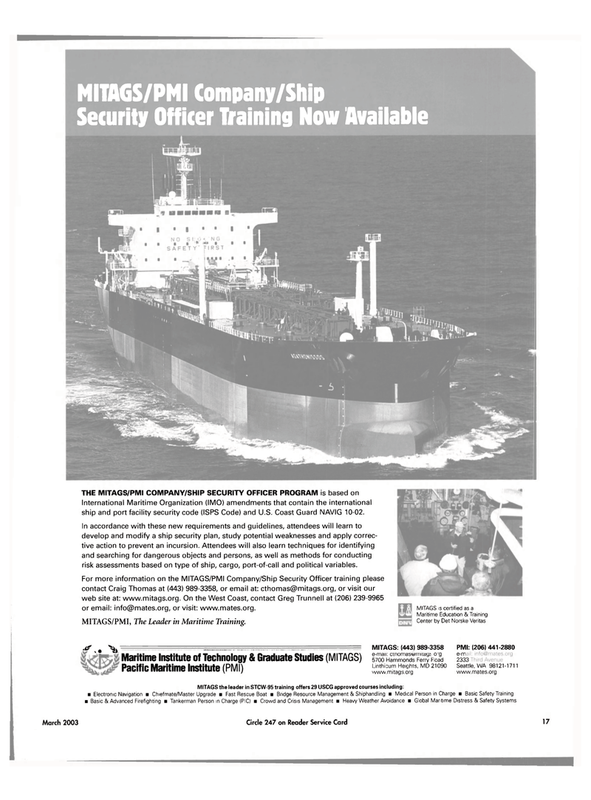 For more information on the MITAGS/PMI Company/Ship Security Officer training please contact Craig Thomas at (443) 989-3358, or email at: cthomas@mitags.org, or visit our web site at: www.mitags.org. On the West Coast, contact Greg Trunnell at (206) 239-9965 or email: info@mates.org, or visit: www.mates.org. MITAGS/PMI, The Leader in Maritime Training.